Productronica 2017, the international exhibition of electrical engineering and electronics industry, was held successfully at the Messe exhibition site in Munich, Germany, from 14 to 17 November 2017. The innovations at the fair were much appreciated, especially for EMSs (Electronic Manufacturer Equipment), ie companies, such as Elettronica FM, which produce electronic devices in high quality standard with SMT technology. Precisely for this reason, the booth project envisaged a solution that would integrate the innovative aspect, with product and multimedia exposure to the manufacturing and design, with unique architectural details. 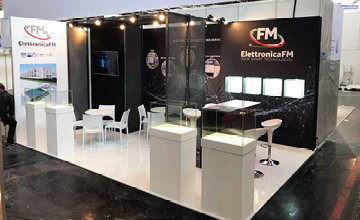 Participating in international events represents an opportunity for growth and strengthening on markets in which Elettronica FM is already present thanks to the continuous innovative and technological drive and a mission that is increasingly aimed at internationalization.